Crossfire. Fuego cruzado—. Spain built the stone fort to your right, called San Juan de la Cruz, or “El Cañuelo”, to create a deadly crossfire with the guns of Castillo San Felipe del Morro on the other side of the bay. Just imagine yourself as an English ship captain around 1640 thinking about entering San Juan’s harbor to attack the city. To keep your distance from El Morro’s mighty cannon you might try to sail on this side of the bay. But the guns of San Juan de la Cruz were waiting here to stop you. 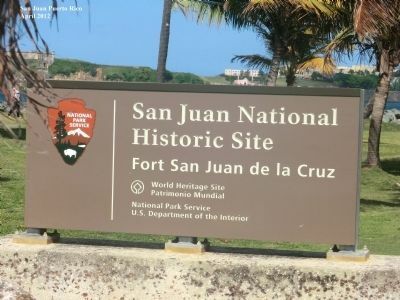 Spain built the stone fort to your right, called San Juan de la Cruz, or “El Cañuelo”, to create a deadly crossfire with the guns of Castillo San Felipe del Morro on the other side of the bay. 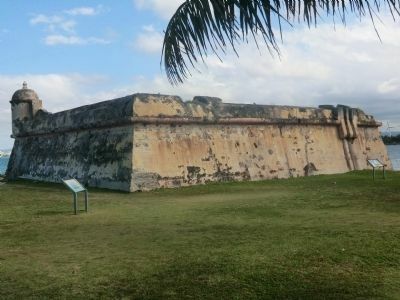 San Juan de la Cruz may have been small, but it played a key role in San Juan’s defenses. 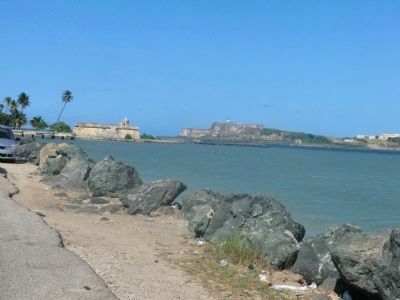 A Spanish ship (right) passes safely between San Juan de la Cruz and El Morro. 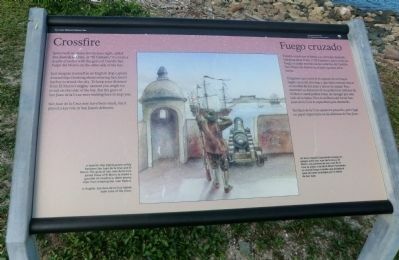 The guns of San Juan de la Cruz joined those of El Morro to create a gauntlet of crossfire to deter enemy ships from entering San Juan Harbor. In English, San Juan de la Cruz means Saint John of the Cross. Imagínese que usted es el capitán de un buque inglés cerca del año 160 y que debe intentar entrar en la bahía de San Juan y atacar la ciudad. Para mantener su distancia de los poderosos cañones de El Morro usted podría tratar de navegar por este lado de la bahía. Pero la artillería del fortín San Juan de la Cruz lo esperaban para detenerlo. San Juan de la Cruz quizá era pequeño, pero jugó un papel importante en las defensas de San Juan. Un barco español (izquierda) navega sin peligro entre San Juan de la Cruz y El Morro. 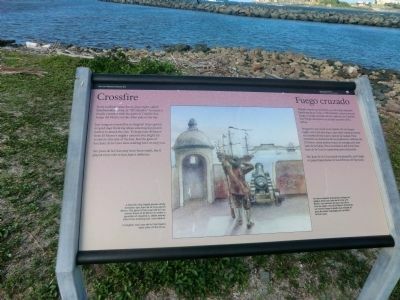 Los cañones de San Juan de la Cruz se unían a los de El Morro formando un mortal fuego cruzado que evitaba el paso de naves enemigas por la bahía de San Juan. Location. 18° 27.984′ N, 66° 8.196′ W. Marker is in Palo Seco, Puerto Rico, in Toa Baja Municipality. Marker is on State Highway 870. Touch for map. Marker is in this post office area: Toa Baja PR 00949, United States of America. Touch for directions. (approx. 0.9 miles away); A Defense of the 1st Order (approx. 0.9 miles away); a different marker also named Defending San Juan (approx. one mile away); Francisco de Miranda (approx. 1.3 miles away); Casa Natal de Don Ramón Power y Giralt (approx. 1.3 miles away). Touch for a list and map of all markers in Palo Seco. More. Search the internet for Crossfire. Credits. This page was last revised on June 25, 2017. This page originally submitted on October 5, 2012, by Don Morfe of Baltimore, Maryland. This page has been viewed 275 times since then and 5 times this year. Photos: 1, 2, 3, 4, 5. submitted on October 5, 2012, by Don Morfe of Baltimore, Maryland. • Bill Pfingsten was the editor who published this page.